Divorced from the controlling institutional crap of religion, I find the New Testament to be a useful well of wisdom on occasion. Lately, I’ve noted that it directs us pretty explicitly regarding Memos. The New Testament refers in multiple places to letting those who have ears, hear, and those who have eyes, see. Matthew, Mark, and Revelations all contain directives to open our ears and our eyes. Memos are really the result of following these directives. You have ears – hear it. You have eyes – see it. It’s all around you. There are no coincidences. If you’re hearing it, if you’re seeing it, then there is something in it for you. Introduction to the new, validation of the old, invitation to explore, navigation along the way – it’s all there for you. Be careful and be discerning – don’t project onto the Memo. Just open your ears and your eyes, observe it, and allow what you already know in your heart to bubble to the surface. About once every three weeks or so, I have a night where sleep, that dirty, rotten say-out, either won’t stick around or doesn’t show up at all. At some point, I arise with disgust from my bed, maybe make a snack, surf the net, concoct a haiku about my plight and share it on Facebook… ANYTHING to alleviate the torturous boredom of not falling asleep, even when desperately tired. A few times, I’ve deliberately decided to throw anti-insomnia caution to the winds, cease resisting the Universe, and just embraced the situation with late night electronics exposure. Having a PC hooked up to my big screen comes in handy during these interludes. 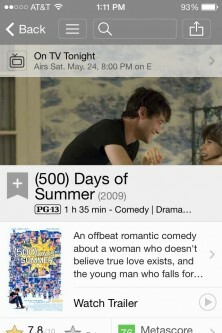 I streamed this movie, (500) Days Of Summer, from Amazon Instant Video the other night. The very first thing you notice is how much Zoey Deschanel really does look like Katy Perry… and vice versa. The last thing you notice is that you’ve just been given a lesson in truly hearing and seeing. The thing is, you have to be open to hearing and seeing stuff that you might not want to hear or see. Even in retrospect – especially in retrospect! – we can tend to hear and see only that which fits our preconceptions. We can tend to miss the truth, the reality of the situation. This is a sort of a squandering of a perfectly good Memo. They make it clear in the trailer and in the narration that this is NOT a love story. One of the important lessons of this film is that not everyone who comes into our lives romantically is there to stay. And just because they don’t stay, that doesn’t mean the experience was a waste. Experience is NEVER wasted, if you have ears to hear and eyes to see. I try to imagine where the protagonist would have been had he not had his 500 days. Would he have landed in the interview waiting room at the end? Doubtful – after all, you cannot experience autumn without first having experienced summer. It was inevitable and necessary and useful, even if it did fail. Watch the movie. And be open to ALL the sights and sounds the Universe is serving up to you – not just the ones you want to see and hear, but also the ones you MUST see and hear. Not just the sights and sounds from the good times, but from the bad times, too. There’s lemonade in them there hills!